This glass with care packing tape does two jobs in one, being both a warning and sealing tape. Printed red on strong white vinyl, the adhesive tape is the answer when you are packaging wine glasses, mirrors or sheets of glass. To view our full range of warning tapes click here. 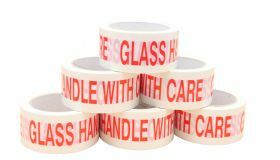 Our GLASS HANDLE WITH CARE caution tape is a superb carton sealing tape made from high quality vinyl with a strong and durable adhesive, thus keeping your valuable and precious items secure. Low-noise to work with, this packing tape comes in packs of six 50mm x 66m rolls and can be used with our tape dispenser or tape gun for speedy application. Printed in red on a white background, the words glass with care are a clear warning, alerting carriers to the special attention and added protection your packages need. The warning tape can also be used as a way of detecting if sealed objects have been opened or tampered with. ** Please note, this is a premium Vinyl tape which is stronger than the other Polypropylene types found online. Using our GLASS WITH CARE self adhesive tape minimises the risk of damage when packing glass items for shipment, moving house or storage. 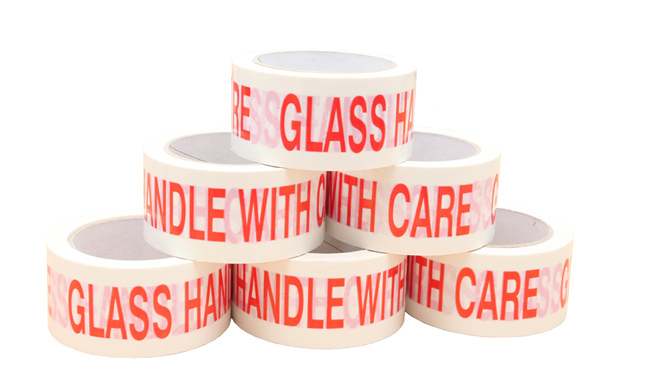 Our printed warning packaging tape is just the thing to seal boxes of breakables like wine glasses, vases, mirrors, picture frames or other glassware. Save time and money with our printed tape as you won’t have to buy extra warning labels and have the bother of sticking them on loads of boxes. Our warning tape does the sealing and warning jobs in one go. Thanks to the clear and easy to read print, using one of our warning tapes is a simple and straightforward way of helping ensure that the goods in your parcels and boxes are protected from damage. For sealing other boxes that need special handling, we also have a range of other printed warning tapes.